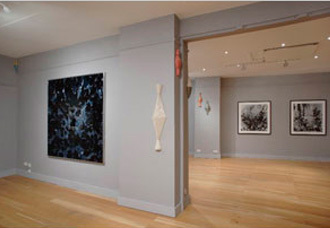 Works by Olivier Richon, Stefan Sehler and Gerard Williams. Photographer, painter and sculptor, they share an interest in the illusion of what is ‘behind’ the physical object in terms of meaning. Formal elements constantly reoccur and link different bodies of work on a visual level in all three cases. 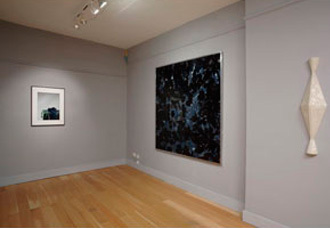 Their work questions aspects of our preconceived ideas about the mediums and materials they each work with. In Olivier Richon’s photographs velvet is used, partly for its strong light absorbing qualities and painterly feel. The object in his work transcends the symbolic, becoming elusive and hard to pin down. 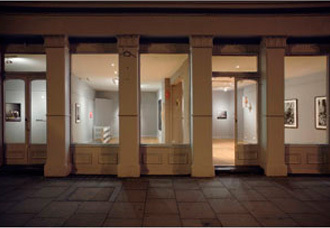 His work is about absence and presence, timelessness opposed to immediacy of photographic medium. It is a meditation on the meaning of photography before relating to the painting itself. Here, he is showing works from his Arcadia series, (referring to the famous Poussin painting) which “reduces the vocabulary of the still life to the baroque figure of the fold”, (Giorgio Verzotti, Artforum, Oct 1992) and The Hunt that “adds to the apparatus of the still life sentences from Plato’s Sophist”. (David Mellor, Porfolio 21). The starting point for Stefan Sehler’s paintings is photography. At the first glance they appear to be photographs or even photograms, as their surface is hidden behind the perspex to which he reverse applies the mixture of oil, enamel and acrylic paint. His unusual technique makes the surface look suspended within it, distancing itself from the viewer. Motifs of flowers, trees, branches and foliage etc. are not representations as such: they are more about the act of painting itself. These ‘surrogate’ paintings are a play between abstraction and figuration, they use controlled chance where “paint does things it’s own way” as the artist himself says. He adds: “The picture is smarter than the painter”. In this new group of works, Gerard Williams questions and reinvents an approach developed early in his career. He has devised and repeated a range of essentially decorative, modular, solid turned wooden forms. These are covered with a disparate variety of furnishing fabrics. Located in awkward places on the gallery walls, they make use of juxtaposition in order to suggest an infinite variety of combinations. These objects are hybrids, apparently accidental, incomplete conjunctions. They set up a dynamic that focuses our attention upon what could be called the surface content of decorative pattern and form: behind the apparently superficial inevitably lie deeply embedded cultural values. 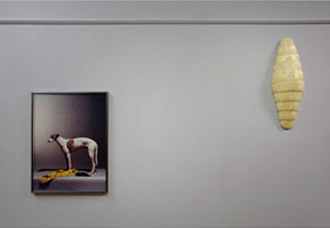 These objects share the wall surface in a way that connects to the notion of picture plane. Basis Lighting for their technical support. www.basislighting.com.